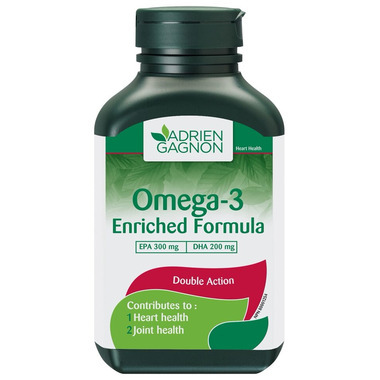 Adrien Gagnon Omega-3 Enriched Formula softgels have a yummy tangerine lime flavour. Omega-3 fatty acids are key for the maintenance of good health. They help maintain cognitive and brain functions as well as good cardiovascular health. Dosage: Adults: Take 1 softgel 1 to 3 times daily before a meal. Important for pregnant women: Health Canada recommends that pregnant women limit their consumption of fish to once a week, in order to reduce the risks of heavy metal contamination, resorting instead to supplements to meet their daily nutritional needs. DHA is critically important for proper brain, eye and nerve development in the fetus.